As well as the usual unpredictable range of stories, we experience some interesting weather systems down here, so our field reporters frequently become storm trackers. We also have plenty of sports fans in our territory and do a fair amount of live sports reporting. Five years ago, we looked at bonded cellular links, which was a fairly new technology at the time - we knew that it would enable our teams to get to a story quicker and speed up our live-to-air process in the field. After comparative-testing several systems, we found the quality and the user interface of Dejero’s blended IP network connectivity technology beat the other manufacturers hands down. We bought a couple of kits, which we have since upgraded, and we now use Dejero’s EnGo and GoBox mobile transmitters in the field, and receivers at the station. Dejero provides this blended network connectivity as a managed service, with a very simple interface at the transmitter and managed in the cloud. It works brilliantly well, especially in metropolitan areas where there is plenty of cellular coverage. However, on the odd occasion, when we need to report outside of the metro area in Kentucky or if the crowd levels are high, the cellular networks become congested and can’t be fully replied upon. So, we went looking for a transmitter solution that would give us instant connectivity regardless of the connectivity status of the networks. As our conventional satellite truck was nearing the end of its life just before NAB 2017, we made a booth appointment with Dejero, who happened to be working on a new concept in partnership with Intelsat: the ability to blend Ku-band satellite with bonded cellular connectivity. We took delivery of Dejero’s CellSat solution for our new truck in October 2017. I call it a truck, but it is actually a Chevrolet Traverse, a mid-sized SUV, which is great because anyone can drive it with no need for special licenses. With CellSat on board, unlike a traditional SNG truck set-up, there is no need to bring in specialist operators or pre-arrange a satellite slot - which can be very restrictive and expensive. You simply put up the dish and it connects on demand – only when the cellular signal isn’t strong enough. What’s more, blended CellSat data charges are managed and billed as on demand alongside the regular cellular charges by Dejero, so we get a single, clear operational bill. Just before the new year, we used CellSat for coverage of the Music City Bowl, a popular post-season college football fixture which takes place annually in Nashville. We wanted to enhance the NBC coverage with a 90minute special wrap-around at the end of the game, added live. We used 2 cameras, one connected to the in-vehicle encoder/transmitter and using CellSat and the other connected to a Dejero GoBox and using cell. Although the Nissan Stadium, home of the bowl, is in downtown Nashville which usually has solid connectivity, with somewhere around 70,000 fans turning up for the game we figured that the cells could get overloaded so we needed a backup. CellSat gave us extra confidence that we wouldn’t lose connectivity. It worked perfectly for our operator. Back at the station, we couldn’t tell whether the video was coming in via satellite or cell; the picture quality was that good. The latency was also just like any other cellular shot that we have done. We’ve also taken CellSat out for storm tracking (you never know what might happen with the cellular coverage in bad weather) and so far, the Satellite back-up hasn’t been needed for this. That’s the great thing about the CellSat system - back-up is automatically there - you don’t have to use the satellite if you don’t need it. Now we can confidently broadcast live from virtually anywhere, safe in the knowledge that if the available cellular bandwidth deteriorates, CellSat will automatically blend in Ku-band IP satellite connectivity to boost bandwidth so we can get high quality live shots to air while saving time and money. Sam Gordon is a 27-year veteran at station WLEX-TV. 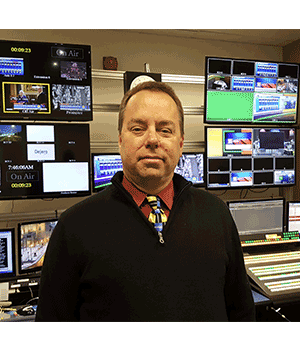 He spent 10 years behind the cameras in news, then 15 years in engineering. For the last two years he has been operations manager for the station, overseeing production and engineering and responsible, as he says, for everything from transmitters to cloakrooms!